Monday 4th May is the feast of the English and Welsh Martyrs of the 16th/17th centuries, who trained abroad as priests or made their homes available for the celebration of the Eucharist. The famous Triangular Lodge at Rushton just outside Kettering, constructed by Sir Thomas Tresham, is full of symbols of the Mass. It was a sort of protest by a local subject. 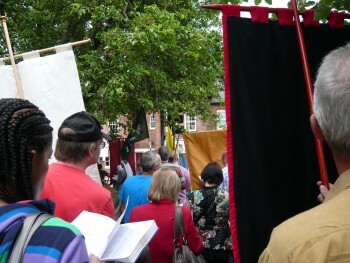 In the past we have celebrated our faith in the Eucharist with processions from St Edward’s to St Thomas More School. On Sunday 7th June, the feast of Corpus Christi, we are able to have a procession within the grounds of St Edward’s School. As well as our Parish Banner, we have banners for nearly all the societies in the parish, for the Scouts, and for the Deanery. We begin with Benediction and then – stopping at two other altars for prayers – will make a complete circuit of the school, with songs and prayers on the way. There is good car-parking – and hopefully many from our parish and perhaps from other Pastoral Area Parishes, will be able to join us. Sunday 7th June 3-4.00pm, with light refreshments to end. Do put this in your diary.